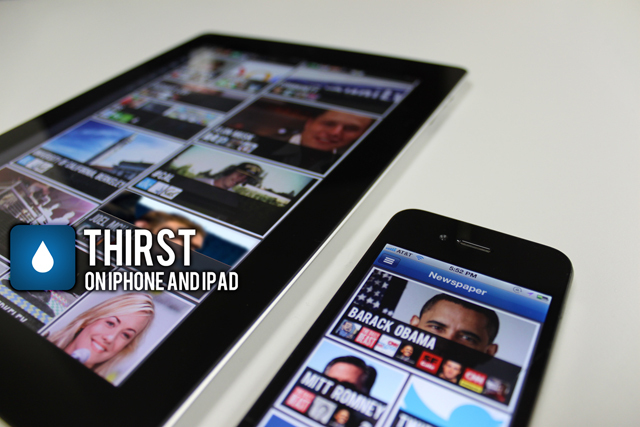 Thirst, an app that helps users get caught up with important news as it’s shared on Twitter, is expanding beyond the iPad today with the launch of a “universal” app that works on the iPhone and iPod Touch, too. Thirst launched in May, and as co-founder and CEO Anuj Verma tells me, its goal for the current app is to bring people up-to-speed on the most important Twitter updates. So when you open Thirst, you get a personalized “newspaper” with the hottest news stories since the last time you opened the app — which could be an hour or a week ago. Behind the scenes, Verma says Thirst has developed a natural language processor that determines which tweets are related to a given news topic, regardless of the exact words used. As an example, Verma says that on the day of the Supreme Court decision on healthcare, Thirst automatically aggregated all of the related tweets, whether they used a specific phrase (“Obamacare”, “health care”, “SCOTUS”, etc.) or not. You can also tweet links and commentary from within the app, with Thirst suggesting the most appropriate hashtag for a given topic. Verma demonstrated the iPhone version for me last week. The look and functionality are pretty similar to the iPad version — it’s just that instead of splitting a single screen into multiple columns for navigation and content, you now swipe between different screens. As Verma has said before, the company’s vision goes beyond any one social network. He says it made sense to start with Tweets: “Let’s start with the hardest one first.” That’s because a tweet, with only 140 characters, provides relatively little of the context that helps Thirst understand “what it might be about.” Now that Thirst has made its approach work on Twitter, Verma says, “Technology-wise, it won’t be too hard for us to move on” to other types of content — though it sounds like there aren’t any concrete plans. Verma adds that Thirst’s technology can do more than recommend news articles, with possible expansion into other topics and types of content.